The last weekend of March is shaping up to be a beauty across eastern Colorado as for the first time in weeks we don't have a Saturday cold front on the way. Temperatures will be warm both Saturday and Sunday across the plains, with the only real nuisance being the wind, especially Sunday. 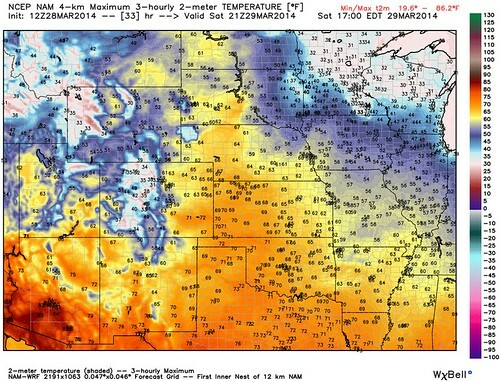 The hi-res NAM has temps in the mid to upper 60s both days which seems reasonable. MOS guidance even has a few mid-70s by Sunday, but this might be too warm. If you're headed to the high country to enjoy some of this week's good spring snow prepare for windy conditions up there with chilly conditions as well. We expect both days to be in the 30s for most locations, with another chance for mountain snow returning by Sunday into early next week. There's an outside chance that we will have more significant changes on the way for Colorado by the middle of next week, so definitely stay with Weather5280 as we'll outline all those details in this weekend's State of the Atmosphere. In the meantime, happy Friday and enjoy a well-earned warm weekend! March: In Like a Lion, Out Like a Lamb?